Tactically, this one was pretty straight forward. 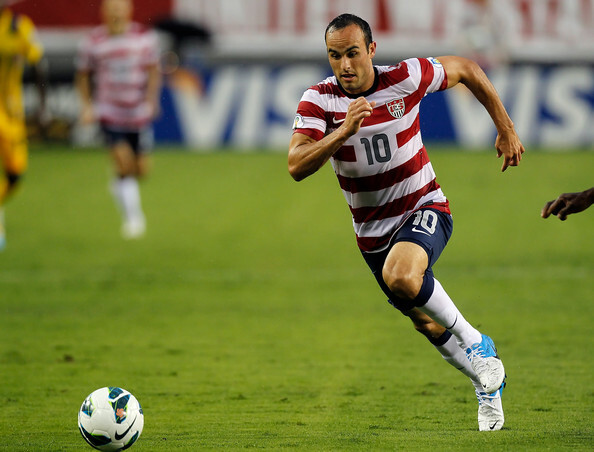 Jurgen Klinsmann was so confident – and rightly so – that the US would see the majority of possession that he brought on possession-minded midfielder José Torres to replace the injured left backs Fabian Johnson and Edgar Castillo. That personnel choice predicted the nature of the game. The US would attack, attack, attack and Antigua and Barbuda would counter. The 3-1 scoreline somewhat underwhelmed given the US possessed the ball for 75% of the game, but a phenomenal performance from goalkeeper Molvin James (9 saves) was all that kept the night from being a runaway US party. Klinsmann elected for a base 4-3-3 that often looked anything but. 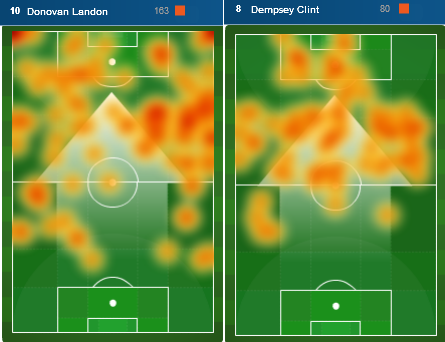 Clint Dempsey and Landon Donovan roamed all over, making it hard to pin an exact shape on the US attack, though perhaps it was most like 4-3-2-1 for much of the evening. Like Bob Bradley’s 4-4-2, Dempsey and Donovan’s positioning drove the attack. They covered an astounding amount of ground and Antigua and Barbuda struggled to account for their constant movement. Donovan and Dempsey made life difficult for the Antigua and Barbuda defense by moving all over the pitch. The two attackers combined to earn the penalty converted by Dempsey, though over the course of the evening Donovan presented the more consistent threat. Not only did he provide the service that led to the first and third goals, Donovan also created 11 of the USA’s 19 key passes (services that led to a goalscoring opportunity). While none of the Americans had a bad night offensively, Herculez Gomez was the other standout. He scored the clincher in the 72nd and headed in Donovan’s corner to set up Bocanegra’s opening goal. Perhaps more impressively, he only misfired on one pass the entire evening. Unfortunately, the American defense wasn’t as impressive. The backline didn’t have a lot to do against Antigua and Barbuda’s countering 4-4-1-1, but when it mattered, they failed to come through. Most of the blame for the lone goal falls on Oguchi Onyewu, who took an odd angle to challenge striker Peter Beyers. Clarence Goodson and Steven Cherundolo are also not above reproach. The pair didn’t close down Mikele Leigertwood, which allowed him to pick out Beyers. A similar mistake against Guatemala on Tuesday could be deadly. And given the injury sustained by Torres, the Americans might need to rely on that backline a little bit more in Guatemala. Gringos, obviously the injury to Torres will be the key outcome of the match, but what did you think of the attack? Were you as impressed as we were by James’ performance? James’ performance was commendable. But I am far more concerned by a number of development for the US. First, the overall flow of the game was horrendous. The movement of the ball and the US players was slow and lethargic. I really hope it was the rain, but I’m wondering if it isn’t fatigue. And if it is fatigue, then that is on Klinsmann. Also, slotting Torres at left back may have been JK’s first truly boneheaded move (or second if he is wearing out his players, or third if you consider he should have always called up Lichaj). And then the unnecessary injury happens Torres, which leads to Bocanegra inexplicably being moved to LB and then the Onyewu debacle. Despite the win, I think this Klinsmann’s worst game as a manager. Why not drop Edu or Jones from the starting XI for Torres – did we really need two destroyers against Antigua & Barbuda? Why not give Cameron or Parkhurst a game at left defender; a game that would have given them needed playing time going into a tougher Guatemala match (was Torres ever going to play left back in that match?). Needless to say, I am not hopeful for the three points in Guatemala City. And to think I will still pay $30 just to see it! When I heard Castillo was out, I thought, ok, at least we can see what Parkhurst can do. I then thought the same thing when Torres got hurt. Maybe Klinsmann just doesn’t rate him at left back. Had Klinsmann used another left back, I think Torres would have started as one of the midfield trio. But once Torres was placed at left back, Klinsmann had to put on two holders to provide cover for Torres, at least I hope that’s what he was doing. It was a bit of a puzzling day, like you said.